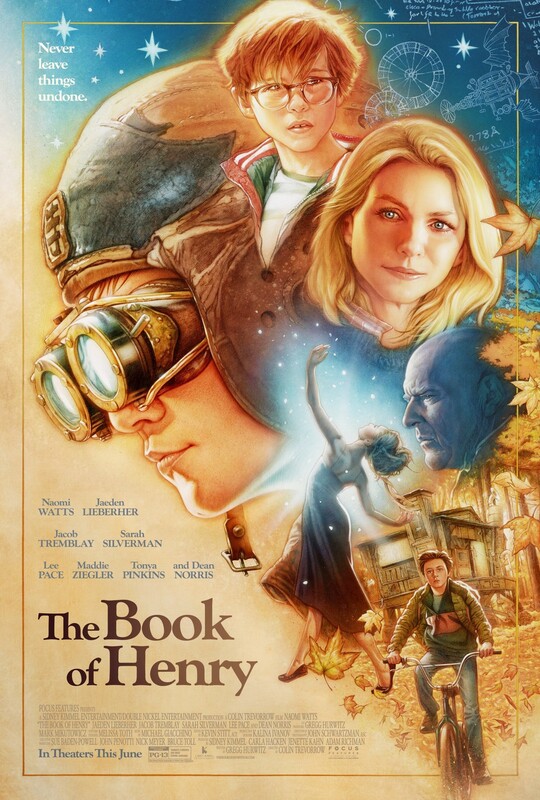 In the midst of superheroes and mummies, we get a quiet little film called The Book of Henry. Is the star power of Naomi Watts enough to get this film heard over its loud and flashy competition? Naomi Watts stars as Susan, a mom of two boys, Henry (Jaeden Lieberher )and Peter (Jacob Tremblay). Peter is your average kid, but Henry is a super precocious 11 year old who is the man of the house. Susan is the mother, but Henry is the one who not only makes sure they are provided for, but that the household routines are getting followed. In their community everyone knows Henry as the smart kid who takes care of things. And his need to take care of things intensifies when it comes to their next door neighbors. Christina (Maddie Ziegler) is obviously going through some type of abuse at home and her step father Glen (Dean Norris) is the prime suspect. Henry puts his considerable smarts to the task and leaves a book that details how to save Christina. When his mom discovers it, she has to decide if she will let Henry dictate her actions as he always has, or if she is actually capable of being an adult on her own. The story starts off slow. We immediately see Susan is much better at playing Gears of War and leaving the actual adulting to Henry, who pretty much takes care of everyone around him. Henry is shown to be more of an adult than most of the adults he interacts with, which is a little unbelievable in some cases. As we follow Susan as she goes through the plan Henry lays out, your suspension of disbelief gets further tested but the flick isn’t so bad that you can’t just go along with it. There are bits of humor that ease it along, and many many feels that pull you into the story. What really holds this story up is the strength of the character acting. The child actors in this film are surprisingly mature and solid. They never feel like they’re just there to be cute or cheap. Which is good because this movie relies on them heavily. Jaden Lieberher is quite real as a genius with a protector streak. He really manages to come across as an adult stuck in the body of an 11 year old. There’s also real chemistry between the mom and her two sons, they definitely come off as a quirky tightly knit tribe. Jacob Tremblay perfectly sells the role of an average kid who idolizes his older brother yet lives in his shadow. Maddie Ziegler (famous as the dancer in Sia’s Chandelier) is perfect as Christina, even though she doesn’t have many lines. Sarah Silverman also gets a few laughs as Susan’s hard drinking friend who has a gruff relationship with Henry. Where the movie falls is its pacing. The movie establishes our setting agonizingly slow, only picking up the tension once we realize the characters don’t have as much as time as they thought. Even though this is a tear jerker at times, you’re not really sure if you’re crying because you are enjoying the film or because the actors have really made you believe in their characters. The plot does test the limits of belief of what an 11 yr old, even a genius, can pull off but luckily pulls back a bit for the somewhat predictable conclusion. Overall, it’s a decent film that mixes laughs, pain, and hope. The last twenty minutes give the film a much needed shot of tension capped with a touching, hopeful ending. They probably did the movie a disservice by releasing it in the summer season when most moviegoers are used to seeing something much more intense with a much faster pace.